Many next-generation electronic and electro-mechanical device technologies hinge on the development of ferroelectric materials. The unusual crystal structures of these materials have regions in their lattices, called domains, that behave like molecular switches. The alignment of a domain can be toggled by an electric field, which changes the position of atoms in the crystal and switches the polarization direction. These crystals are typically grown on supporting substrates that help to define and organize the behavior of domains. Control over the switching of domains when making crystals of ferroelectric materials is essential for future applications. 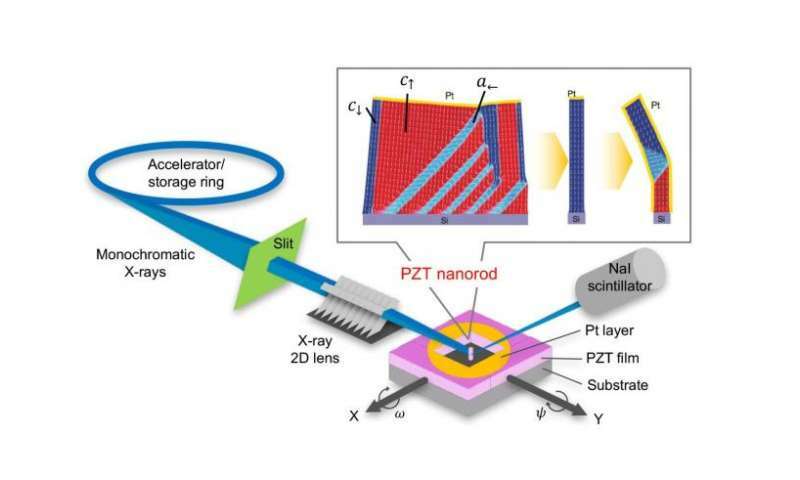 Now an international team by Nagoya University has developed a new way of controlling the domain structure of ferroelectric materials, which could accelerate development of future electronic and electro-mechanical devices. "We grew lead zirconate titanate films on different substrate types to induce different kinds of physical strain, and then selectively etched parts of the films to create nanorods," says lead author Tomoaki Yamada. "The domain structure of the nanorods was almost completely flipped compared with [that of] the thin film." Lead zirconate titanate is a common type of ferroelectric material, which switches based on the movement of trapped lead atoms between two stable positions in the crystal lattice. Parts of the film were deliberately removed to leave freestanding rods on the substrates. The team then used synchrotron X-ray radiation to probe the domain structure of individual rods. The contact area of the rods with the substrate was greatly reduced and the domain properties were influenced more by the surrounding environment, which mixed up the domain structure. The team found that coating the rods with a metal could screen the effects of the air and they tended to recover the original domain structure, as determined by the substrate. "There are few effective ways of manipulating the domain structure of ferroelectric materials, and this becomes more difficult when the material is nanostructured and the contact area with the substrate is small." says collaborator Nava Setter. "We have learned that it's possible to nanostructure these materials with control over their domains, which is an essential step towards the new functional nanoscale devices promised by these materials." The article, "Charge screening strategy for domain pattern control in nanoscale ferroelectric systems," was published in Scientific Reports.